Amado Ruperto Samuel was born on December 6, 1938 in in San Pedro de Macoris, Dominican Republic. The six foot utility infielder was signed in 1938 by the Milwaukee Braves. He was a pioneer in his own right, being the very first player in a long line of short stops signed out of the small town of San Pedro des Marcoris. He bounced around the minors for a full decade before spending parts of three seasons in the major leagues. 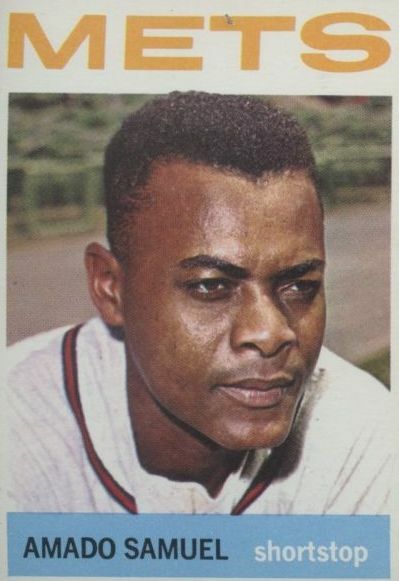 Samuel made his debut in 1962 with the Milwaukee Braves, playing in a career high 76 games batting .206 hitting all three of his MLB career HRs. In 1963 he played in only 15 games at the major league level, batting a weak .176 before having his contact purchased by the New York Mets. 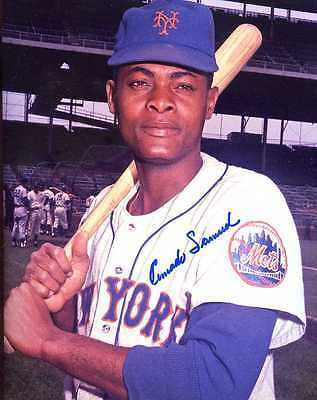 He played mostly at short stop (34 games) with some third base as well (17 games) in 53 appearances for the ’64 Mets. In the first game ever played at Shea Stadium, he batted in the 8th position was the starting short stop. He drove in the second & third runs of that historic game with a base hit off Bob Friend in the fourth inning. He had a five game hit streak in June, collecting ten hits during the stretch. He had his career day at the plate, on Saturday June 20th, getting three hits against the Philadelphia Phillies at Shea Stadium. The next day was Fathers Day 1964, & Samuel was robbed of a hit by Cookie Rojas, preserving Jim Bunning’s perfect game. In 53 games on the season, he hit a career high .232 with seven doubles and five RBIs. He posted a .945 fielding percentage making six errors in 106 chances. By July he was sent back down to the minors finishing off his three year MLB career. He played in 144 games with 79 hits 3 HRs 25 RBIs 18 doubles & a .215 batting average.